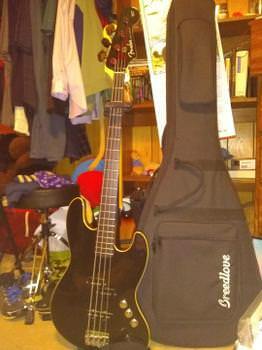 My main bass is a Fender Aerodyne Jazz Bass. It has a P/J pickup design and oh man can that thing be a tone machine. They are a little over 800 sticker price but I got mine for a little cheaper, if you can do that, it is definitely worth it. Here is a pic of mine. If you're traveling outside of the US, be careful what you buy. US Customs agents are confiscating anything with Rosewood. i even thoght of getting an epiphone sg bass. just to have something dif. You could pick up a MIM Fender PBass for about $800.